This is not so much a tool as it is a collection of pieces of software I have used for many different things over the course of my career. I found a very helpful use for these tools in Elite Dangerous...Figured I would share. I like many, find myself alt tabbing out of game a lot for very simple things. I only have 1 Ultrawide monitor attached to my PC currently. No aux monitor to throw things up on and leave up and work off of. For instance I want to do an explorer run for HMC/TWW/ELW. (Road to Riches) I accomplish this with little work via Voice Attack commands, but found myself constantly alt-tabbing to get the next hop and trying to see how many ls away the next planet was I needed to scan in that system. These tools are not specific to Elite and not limited to web browsers, but I figured I would share my use case and allow anyone else to make best use of a single monitor if they don't enjoy alt tabbing out constantly. Google Chrome with Desktop Applet: saved for no browser bars and minimal view. (This was perfect for the route plotter since its the only site I am going to use for my exploring. Turbo Top - Will keep the windows you select always on top. I did not want to have to edit my own chrome settings(remove bookmarks bar and address bar) each time I wanted to run this in order to create a minimalist approach. Google made it simple you can save any page as a desktop app and load it up every time it will just give you a window with the webpage displayed. Please Note: I am not 100% sure if this works in full screen mode (Elite Client) as I run in windowed mode for the purpose of jumping into other PCs on my network as well as to be able to interact with other windows on my screen. 5. Name accordingly and ensure the check box is selected for open in window. 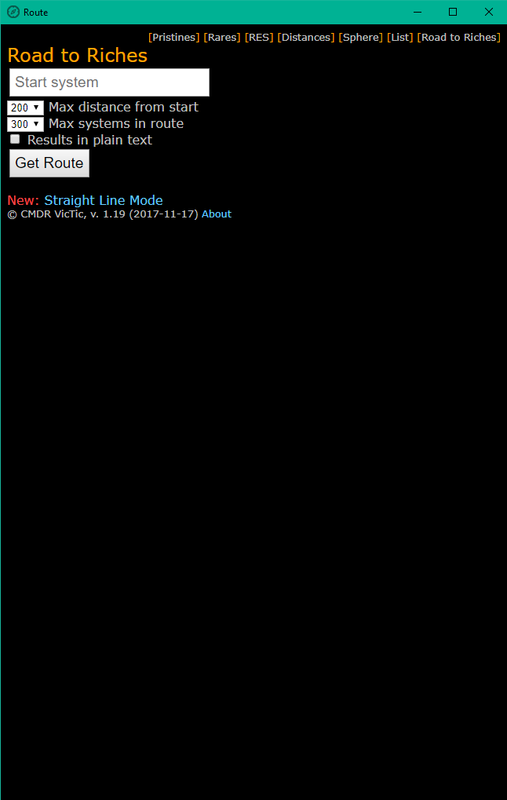 You will now have a direct link with a minimal browser pane to load your routes. 6. Open the new desktop icon created by chrome. 2. Run it and go down to the system tray, right click the icon and choose which apps you want to stay always on top. Note: when I got this up and running on my new windows install I had already opened the route window before installing. The product did not seem to be able to engage always on top. I closed the google chrome desktop pane and then re-opened it and then Turbo Top was able to engage always on top on that window. 1. Install See Through Windows. 2. Open the menu from the system tray. 3. Select your hotkey (I use Ctrl+Shift-Z) This will engage the transparency on the current active window. 5. Select the Chrome desktop applet you have open and activate the transparency on that active window. Move the window where you want it to enable you to still play. Note: If you want to click into the web browser page be sure to UNCHECK the Make window 'Click-Through' option in See Through Windows. I've used Road to Riches, I just saved the webpage results to a PDF and printed them out, then just crossed through them when done to keep track of where I was. Ps I used this version - https://www.spansh.co.uk/riches which works well when printed. Nice alternate site thank you for the link. It is nice that it has a slider for max distance from star...although the problem I was looking to solve was not alt tabbing out. Which if I had the list of 700 systems printed out (no printer) would require either manual typing in the system names or again alt tabbing into a pdf which I couldn't cross out as I progressed. The one I linked has the option on the right for visited and the cache stays for up to 60 days. it remembers where you have been, you just pick up from where you left off. Using voice attack the only thing I do to interact with the window in my screen shot is toggle the visited to yes and then highlight the next system name and "copy". say "Plot Next Hop", VA kicks in: opens gal map, pastes the system name in, plots route, closes out the gal map, initiates jump to next system, drops to throttle 0, discovery scan, targets star on delay so i can line up the shot and starts scanning the star, opens comm panel on delay. I then take a look at the window on the right to target the planet using the distance. Rest is manual for any remaining bodies in the system, but then its back to step one. It def gets boring fast, just watching TV and listening to music. Its a grind for sure, but its worth it. Hopefully using these tools would have other uses for users with single monitors. I know others use OnTopReplica, but that wont work in this scenario since being able to interact with the webpage is helpful. Edit: I know that OTR has the click forwarding feature, but I found that I could not click and drag into that window to highlight the system names for easy "copy+paste". I go another route and just use the Chrome browser on my tablet (or phone). That way I can have whatever ED site I'm using on the tablet and not to have to obscure the game on my monitor. I have Chrome on my tablet synced to it on my pc. That's a much more simple solution.